A portion of the original Cherokee Outlet was opened by land run in 1893. 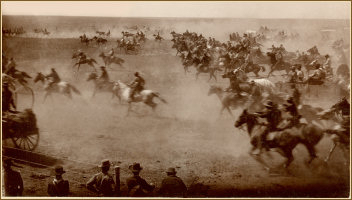 This opening was the fourth, and largest, of Oklahoma's five land runs. According to President Cleveland, " The Run " would take place at 12 o'clock noon on September 16, 1893. Oral tradition claims that a nervous soldier accidentally discharged his gun at 11:55 a.m. and the race was on! By horse, train, wagon and on foot more than 100,000 land hungry pioneers raced for 40,000 homesteads and the valuable town lots available in the Cherokee Outlet Land Opening. Immigrants from almost every area of the United States and many foreign countries took part in this epic event.